For the past 17 years, the Flexible Electronics Conference and Exhibition—2018FLEX— have been witnessing flexible hybrid electronics grow from a newly established technology to a rapidly developing technology leading changes in IoT, smart medtech, smart automotive, smart manufacturing and more. 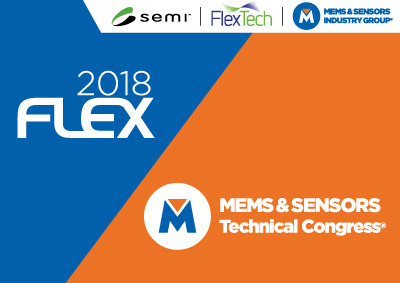 This year, 2018FLEX will be co-located with MEMS & Sensors Technical Congress (MSTC). Since 2001, MEMS & Sensors Industry Group has been hosting its annual technical conference with their primary focus on addressing the market and technology challenges in moving up the value chain and identifying critical market pull. With over 600+ attendees, FLEX is the premier event of the year to kick off 2018. From fundamental materials to applications and end users, we cover an extensive range of topic areas in 3 days packed with information. MSTC and FLEX attendees are encouraged to attend each other’s talks.